Vimitha from My Culinary Trial Room hosted giveaway for 27 coupons.com. From the pool of comments she received, four winners were selected. I'm one among them. 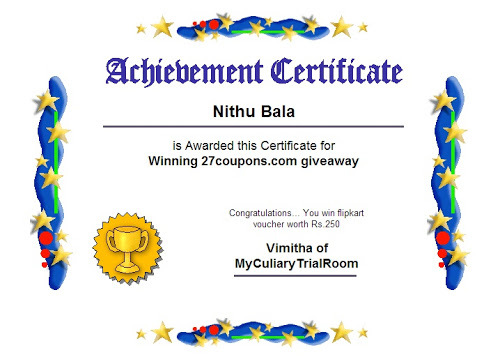 My thanks to Vimitha for the giveaway and the certificate. Hearty wishes to Babitha, Viji and Sharanya who have also won Rs. 250 Gift Voucher from FlipKart.